Greece is the land where dreams are still made. The Gods of Hellas have blessed us with Sirtaki, Bouzouki, Metaxa, Moussaka, oracles and so much more. Artists, Philosophers and in short the cradle of culture are at home in this land of amazing flavors and melodies. 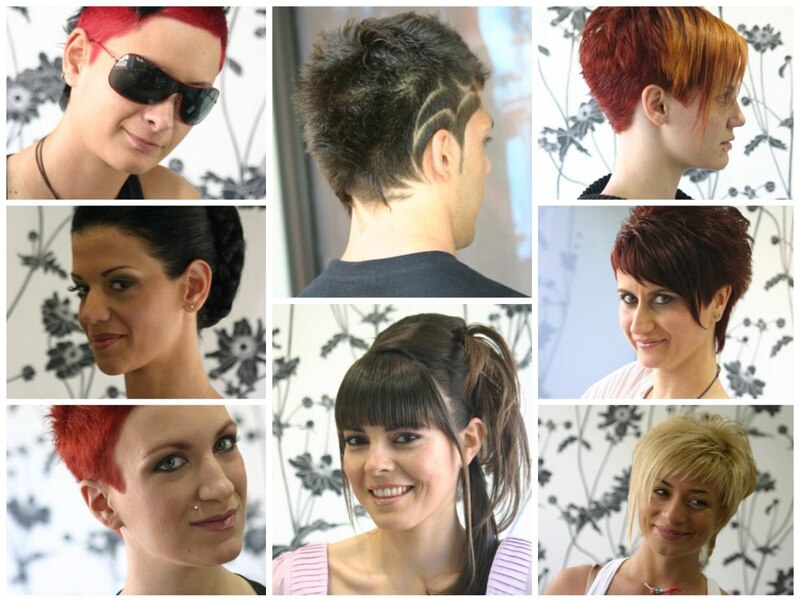 Ikonomakis Salons now bring us the Greek flavor with their sassy collection of hip hairstyles that are full of passion, sunshine, expressive shapes and color like the country they were born in. 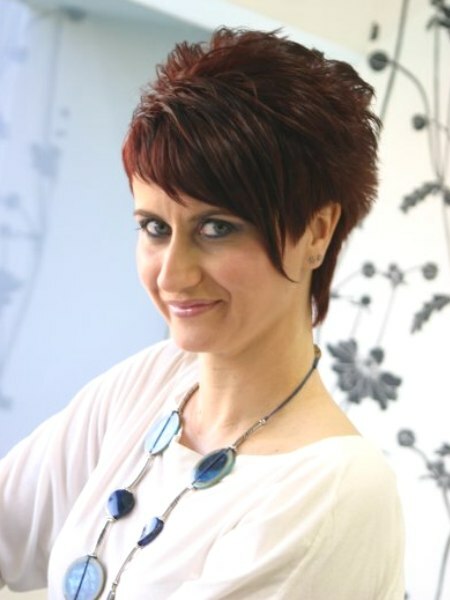 Skilled use of scissors and color meet the creativity that is fueled by Aegean sunshine and the Greek savoir vivre. Each look is a celebration. Each one is unique and made for vibrating people in a fun filled world. OPAH! This elaborate updo was created by separating the hair in wide sections, overlapping those and using smaller strands and mini pigtails to enhance the structure. 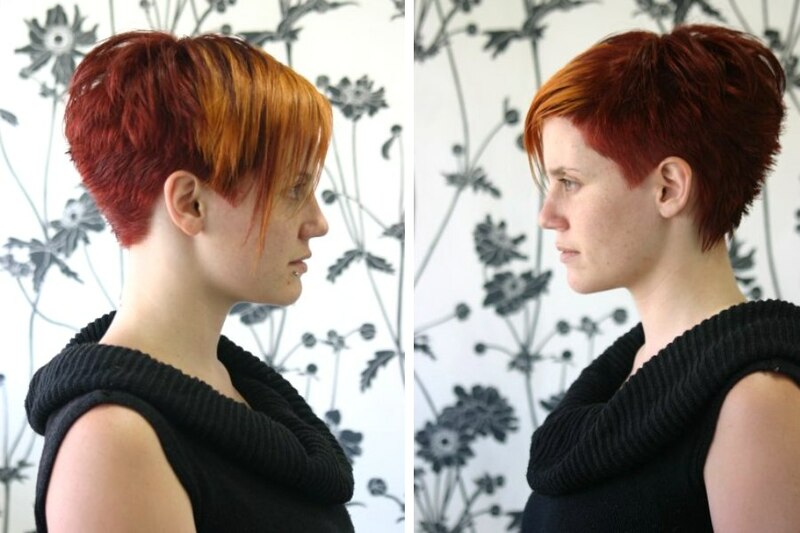 Most of the action is on one side, which gives this look a trendy but still balanced asymmetry. 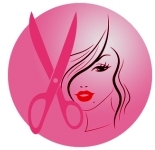 Wide bangs are very straight and sleek adding a fresh and youthful appearance to the look. 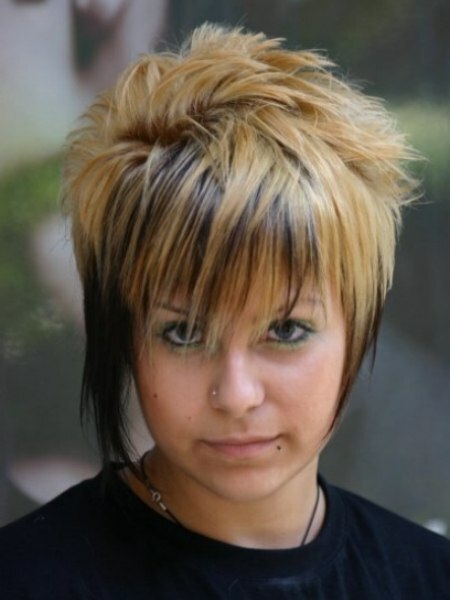 This short blonde hairdo was cut in layers with longer sections on the sides and in the bangs. Several strands are left longer than the rest and all in all the stylist performed an intricate and chic play with different lengths. The resulting look is spunky and super cute in blonde. Styling is easy and there are many variations and options to change the look. 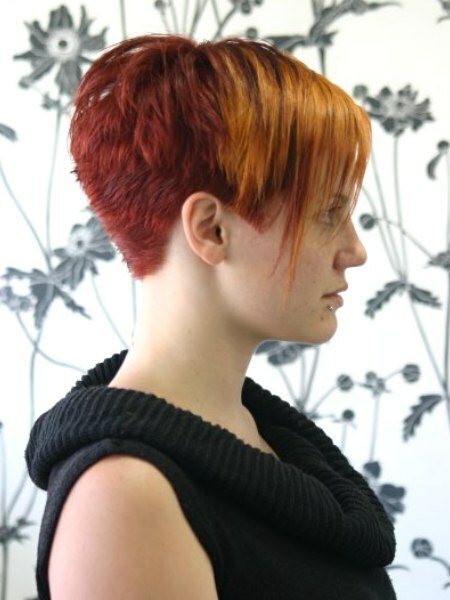 A short clipped neck transitions smoothly to longer hair up the backside of the head and towards the crown. 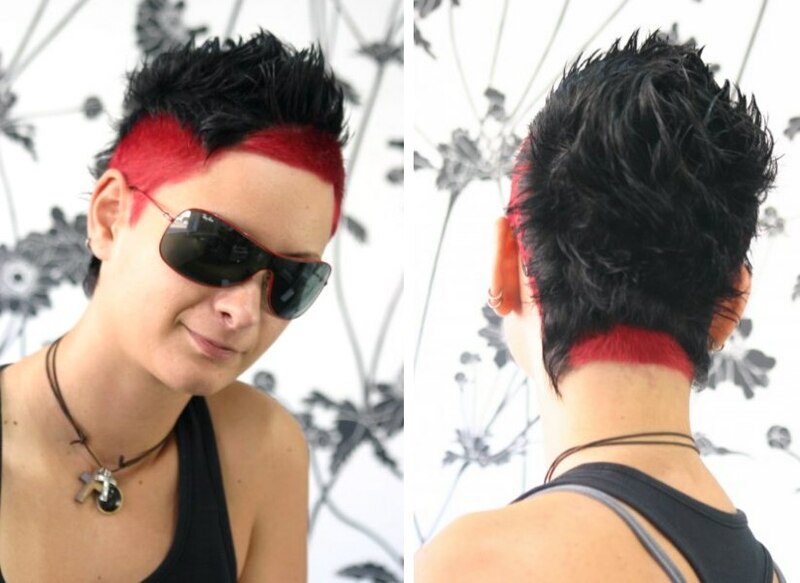 The hair is about one inch long and therefore short enough to stand without much help. A little dab of product should do the trick and make this fun look last all day and through crazy Greek nights. 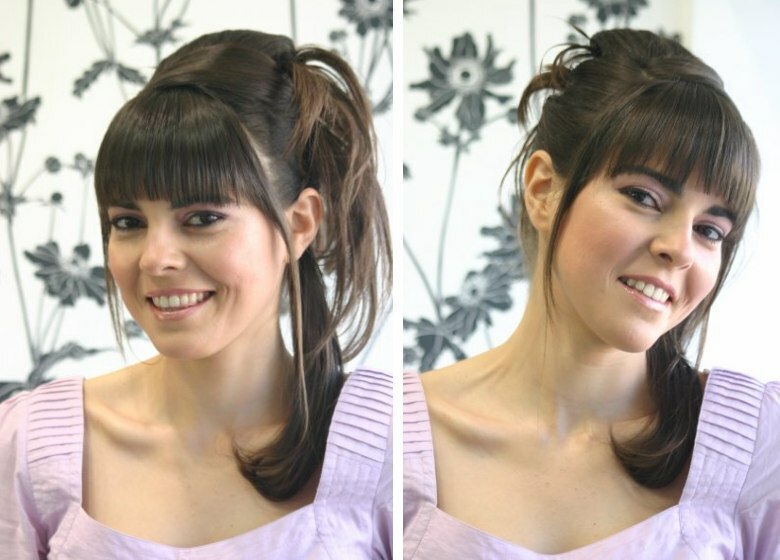 The bangs are longer and styled flat against the forehead with a delicate accent strand along the side. The first thing that pops into the eye with this look is the hair color. The ingenious combination of a warm, almost rusty red with bright brass colored frontal inserts take us right to the spectacular sunsets of the Greek islands. 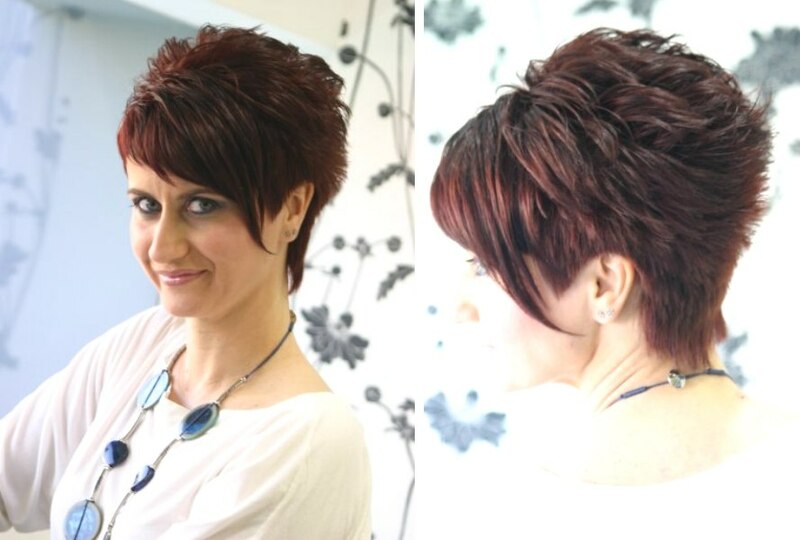 This short layered cut has a free spirited punky attitude and is right on trend target with the varying lengths from back to front and the mix of straight lines and texture. 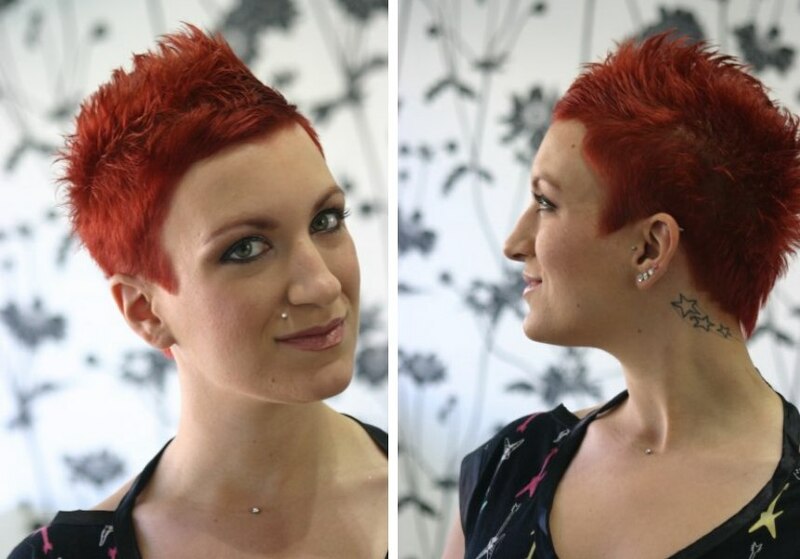 The pyramidal styling of the longer midsection between the very short sides resembles a mini Mohawk, but it is only one way to style this fun and versatile cut. The bangs and side are as short as can be and really show off a pretty face like no other look. Attention is guaranteed with the rooster red color that makes green eyes shine like magic lagoons. This kind of trouble is the kind we all love. It comes in bold colors with a fresh attitude and inspiration. 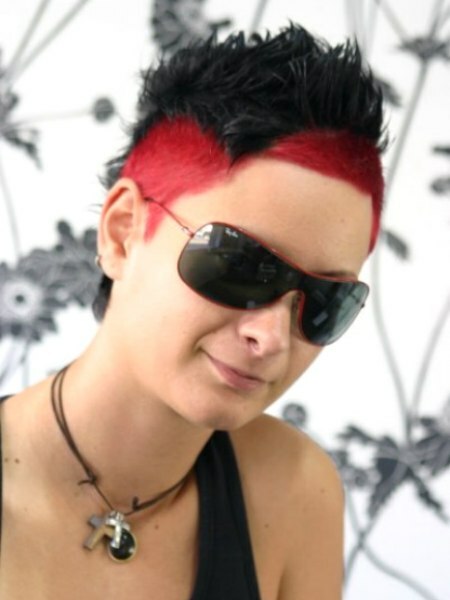 Two extreme hair colors were connected to two extreme textures. This simple equation has an enormous effect. 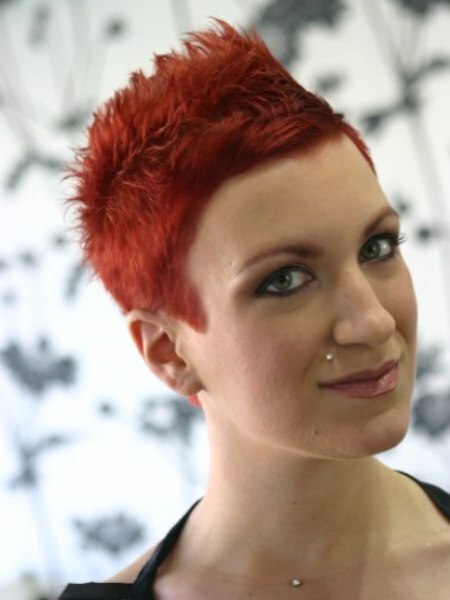 The red velvety base schmoozes the shape of the head with the thickness of only a few millimeters. It is topped by a diagonally placed squarish shape of black spiky thickness. Touchable and wearable art. Two looks in one and all the styling possibilities one could want. 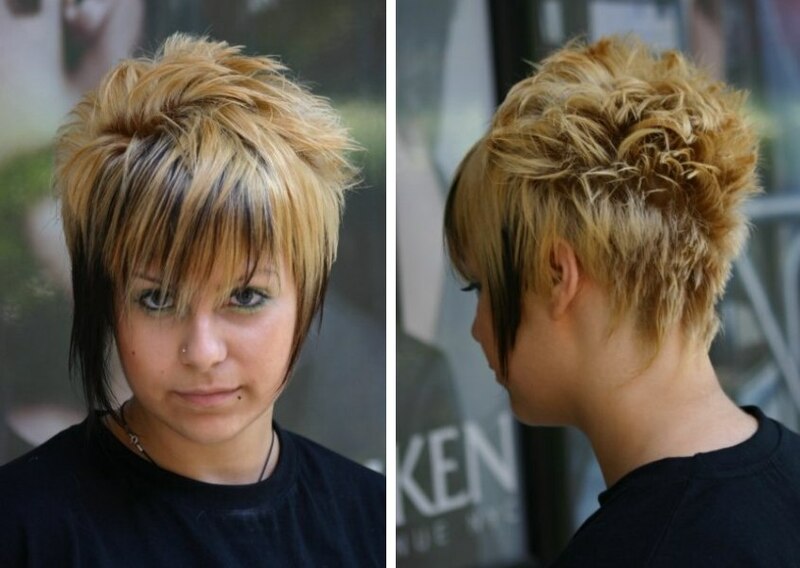 This shorty features varying lengths, a straight and long section in front and a frizzy, spiky, full bodied part towards the back with a supershort neck that was cut in a tiger stripe pattern. The feline element comes up also in the blonde and dark brown stripes that were colored into the front half. Don't think that all Greek men have thick black curls. Some come with a pattern on their head. 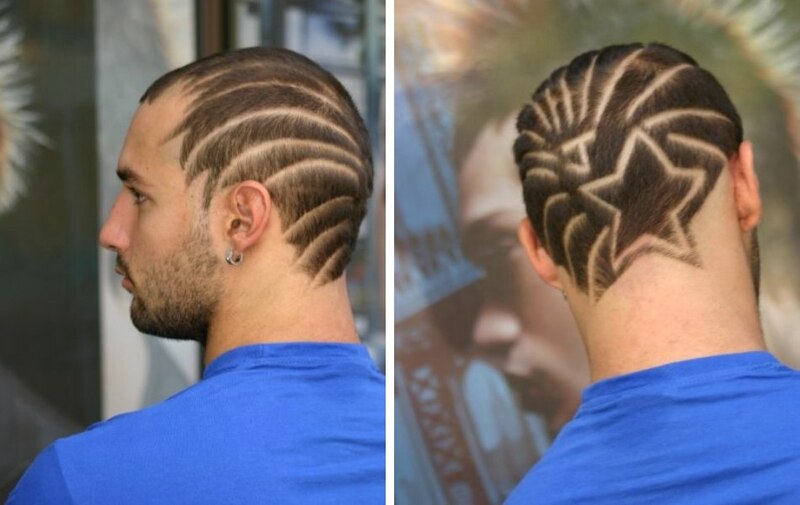 A smooth buzz cut is the perfect canvas for all kinds of playful ideas. This version resembles the bursting of fireworks or perhaps the floral display of palm fronds. No matter what, it definitely makes you look twice. Or three times - or four. 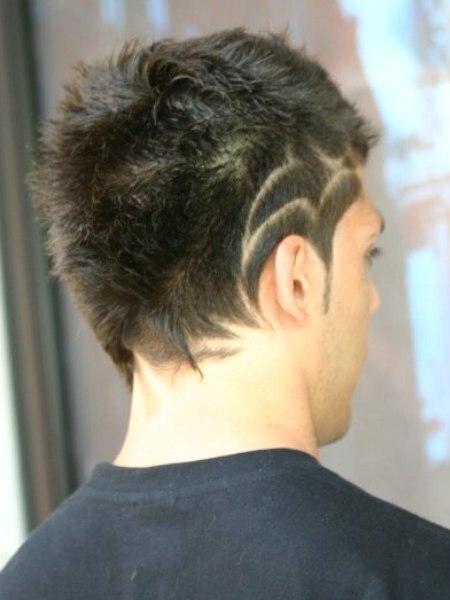 Phantasy patterns are cut into a supershort buzzed side section of hair. He likes to keep the tension by not revealing it all and wears most of his hair longer and just uses the tattoo patterned sides as an eyecatcher and teaser. 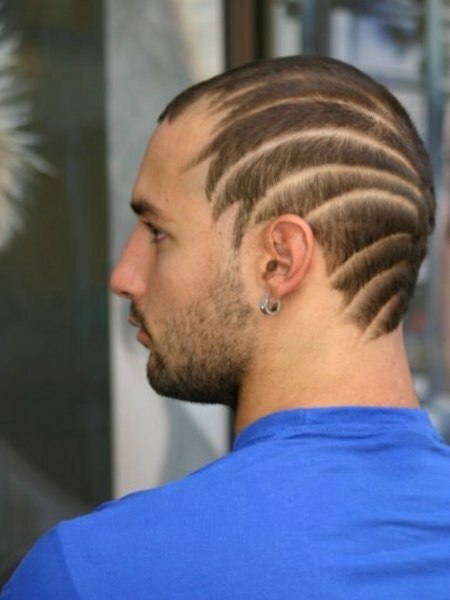 The intricate pattern reaches all the way to the nape. 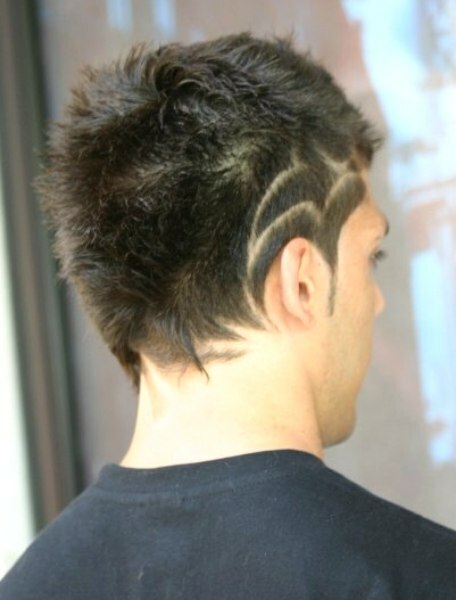 It does require regular maintenance to keep the lines this clear, but this cool look is absolutely worth it.